No. 9 Kansas. No. 8 Kentucky. Rupp Arena. This should be fun. There’s a fair amount of #KUbball gear floating around here today, but this shirt is BY FAR the best I’ve seen... Impressive. 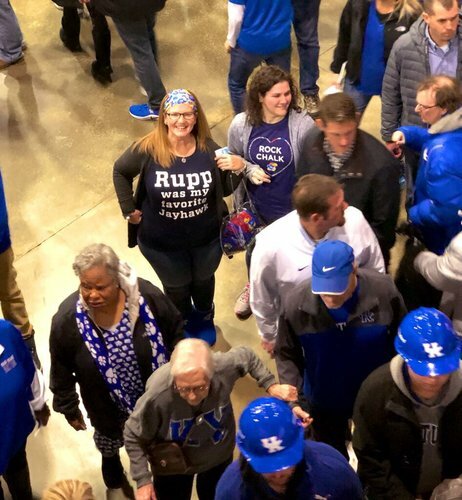 Funny enough - 21,000 of the UK fans at the game today were alive when Rupp played at Kansas. Please remove the dork behind Bilas immediately. Same spot on the Grimes and Vick jumpers... Maybe something #KUbball saw in the UK D? UK has 8 rebounds already. 4 on the offensive glass. #kubball has 3 rebounds and 0 offensive rebounds. Teams are a combined 4-of-16 from the floor. Kentucky has a 38 percent offensive rebound rate, which ranks sixth in the nation. Wildcats already have 4 such boards. 9-3 Kentucky advantage on the glass a little more than 4 minutes in. 4 of those on offensive glass. 2 UK 2nd-chance points. 9-6 at the under 12 TO. #KUbball leads 14-6 after that 3-pointer by Dedric Lawson. Terrific start by Kansas, even with them not shooting it all that well. Their D has been tremendous and their rebounding has been good enough. For now. Timeout UK. 10:26 1st half. How did Dedric keep that ball? Dotson explodes through the paint for a layup. "That's what y'all should do!"